A couple hundred years ago, we didn’t have artificial refrigeration. In fact, in the early 1800s the Ice Revolution was just beginning, which saw thousands of tons of ice manually cut from lakes and rivers for transport to wanting cities. Can you imagine that today? People and horses cutting the ice from our lakes? An ice-cold drink on a summer’s day involved a lot more work. Today, we are fortunate enough to have refrigeration not just keeping our drinks cool, and meat fresh, but our offices and homes cool and comfortable. 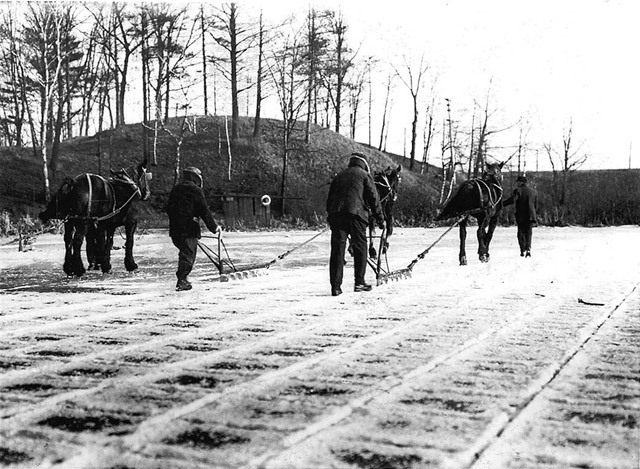 Ice cutting ploughs on Grenadier Pond, 1909. City of Toronto Archives, Fonds 1244, Item 140. By now many of you have likely seen a note or two about “Operation TLC”, UHN’s ambitious and way cool initiative to cut over $2 million from its utility budget. To learn more about this awesome endeavour, Talkin’ Trash’s Second Managing Editor sat down with UHN’s Manager of Energy & Environment to talk energy, fashion and a little TLC. Second Managing Editor (ME2): Welcome to On The Heap, Talkin’ Trash’s trash-side chat. Manager of Energy & Environment (MEE): It’s a pleasure to be here.